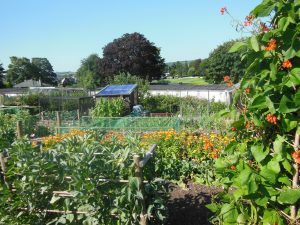 Kendal boasts an impressive 472 allotment plots over 17 sites throughout Kendal. Many groups and individuals enjoy Kendal’s allotments, including Age UK who provide allotment sessions every Thursday morning between 10.30am – 12.30pm. If you would like to find out more contact Charlotte Robinson, Volunteer Support Officer on 01539 728118. The allotment rent is decided by Kendal Town Councillors each year in November. Allotment rent received from tenants is used towards the cost of administration, the services of the Townscape Manager, water bills, repairs and renewing of fencing and boundary walls, pest control and minor tree cutting. The current rent has been calculated at 0.37 p per m2. Each allotment holder signs a Tenancy Agreement. The agreement states that cockerels are not permitted on any of the allotment sites and hens are only permitted on Coley Barn, Sandylands, Underley Hill, Underley Road and Shaws Brow. Tenants found with cockerels on their plots will be asked to remove them immediately as this is a breach of the terms and conditions of the Tenancy Agreement. Interested in Composting on your Allotment? A supplier at Oxenholme Farm leaves out bags of free horse manure outside the premises for collection. Look out for the Horse Stables sign.